Ansia (Crave in Spanish) is on in Argentina. The actors are Julieta Cajal (C), Graciela García Loza (M), Javier Luquez Toledo (A) and Sebastian Simoni (B). The director is Pablo Lescano. Click on the image for more details. Thanks to Pablo for the information. "El gran tema es la soledad, una soledad absoluta, terrible, devastadora, de la cual es imposible salir. Sentimiento de caos, bronca e impotencia, sumado a no poder dejar de oír en la cabeza del otro, las voces propias, que hablan de las cosas que más tememos. Ansia es un monólogo interno. Refleja una batalla terrible que se libra en el interior del individuo. Pareciera que no hay peor violencia que la que uno es capaz de autoinflingirse a través del dolor, del recuerdo de lo atroz, de la incapacidad para lidiar con la realidad. La acción sucede en sus mentes; no los vemos hacer algo concreto, los escuchamos, se dicen a sí mismos, como tratando de explicarse el maremoto de voces, recuerdos, pensamientos y emociones que padecen. Los textos de la autora no tienen misericordia alguna, su explícita violencia revela las turbaciones y el hartazgo de su alma; son tan hirientes que la convirtieron en una escritora polémica, rara, inhóspita. Pero su obra también encarna una escritura de gran precisión, de lenguaje y dramaturgia originales y propios, y de una sensibilidad poética fuera de serie. Phaedra’s Love and 4.48 Psychosis will run in repertory in the 2010 Philadelphia Fringe Festival at the Philadelphia Shakespeare Theatre. They will be directed by Rosey Hay. More details when available. Blasted comes to the Lyric Hammersmith Theatre in London from 22 Oct- 20 Nov 2010. The director is Sean Holmes and Danny Webb plays Ian and Lydia Wilson plays Cate. The design is by Paul Wills. Click on the image for more details. The Library Theatre, Birmingham Central Library in association with SHOUT Festival explore the life and work of Sarah Kane. "The plays of Sarah Kane have been performed all over the world, and translated into countless languages, but it remains little known that her controversial career began here in Birmingham, studying for an MPhil in Playwriting. A life tortured by depression ended in suicide in 2000. Kane was 28. 4.48 Psychosis, her final play, was performed posthumously and was widely believed to be a suicide note. Join us to explore the life and work of this remarkable writer. " It is on 11 Nov 2010. Click on the image for more details. Buddies in Bad Times Theatre present Blasted. The director is Brendan Healy and the actors are David Ferry, Michelle Monteith and Dylan Smith. Set and Costume Design Julie Fox, Lighting Design Kimberly Purtell, Music and Sound Design Richard Feren and Stage Manager Merissa Tordjman. "Blasted has never before been produced in English Canada. Artistic Director Brendan Healy states: 'I am thrilled to be opening my first season with the Canadian premiere of this modern classic. Kane was motivated by a ferocious desire to challenge our culture’s complacency and desensitization. Her plays provocatively defy conventional theatrical form. In my opinion, the fearlessness of her rebellion against the status quo and the depth of her compassion for humanity embody the spirit behind Buddies in Bad Times Theatre. Our production of Blasted is a bold reassertion of Buddies’ relevance as an artistic and political force in our city.'" It is on from 22 Sept- 17 Oct 2010. Click on the image for more details. CUADC present 4.48 Psychosis at the ADC Theatre in Cambridge, UK from 20- 23 Oct 2010. "4.48 Psychosis, the final and most experimental play from controversial writer Sarah Kane, examines with painful honesty the close relationship between depression and love. Kane's unique poetic style perfectly articulates the consequences of unrequited love in a tale of the darker side of human emotion peppered with even darker humour. Confessions to doctors and arguments with lovers slowly reveal a figure fuelled by fear, desperation and relentless hope in a rare naturalistic interpretation of the play. A complex, beautiful and unconventional love story, 4.48 Psychosis considers the possibility that it's worse to have loved and lost than never to have loved at all". Click on the image for more details. Thanks to Leah for the info. The Site for Contemporary Psychoanalysis present a staged reading of 4:48 Psychosis at Arcola Theatre, London on 10 Oct 2010. The actors are Darren Lawrence and Jane Nash. After the performance there will be talks and discussions with Darian Leader (CFAR, College of Psychoanalysts-UK), Haya Oakley (The Site, The Guild, College of Psychoanalysts-UK) and Dr. Michael Sinason (British Psychoanalytical Society). 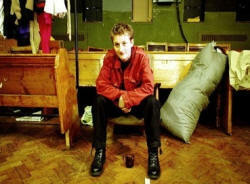 "Sarah Kane's tense and evocative play was first produced at the Royal Court in 2000. In this colloquium on psychosis, the actors will present the play as a rehearsed reading; three prominent psychoanalysts, well known for their distinctive thinking and clinical practice in the field of psychosis, will respond to the play and lead a discussion with the audience". More details are here www.the-site.org.uk . Thanks to Stephen for the information. Love/ Cruelty: Sarah Kane in the Raw features Phaedra's Love and 4.48 Psychosis in the Shakespeare Theatre, Philadelphia, USA from 2- 18 Sept 2010. The director is Rosey Hay. Click on the image for more details. Candentia Theatre Company and The Minnesota Fringe Festival present Crave at the U of M Raring Center Xperimental, Minneapolis from 5-15 Aug 2010. It is directed by Andrea Gail and the actors are Connie Anderko, Sara Michelle Bickweat, Antonio Brunetti and Joel Vining. Thanks to Andrea for the information. Click on the image for more details. The 4.48 Psychosis from Lawrence, Kansas is revived for the Kansas Fringe Festival at the end of July 2010. Because of staging constraints this will be a simplified version of the Lawrence production. The director is Dan Born. "4.48 Psychosis is a black snowflake that cannot melt. The poetic and searing story of a young woman's journey to suicide, the script has no stage directions, no set description, not even a cast list or assigned roles. Each production is compelled into uniqueness; the challenge is to make that uniqueness seem inevitable." Thanks to Dan for the information. 4.48 Psychosis in on at the Lion and Unicorn Theatre, London on 11 and 12 Aug 2010. "Depressed and contemplating suicide, a cast of just three, show you the life of the individual who cannot be named. Speaking aloud his thoughts whilst being trapped in a small room and occasionally conversing with a doctor and a nurse; watch as we witness the last painful steps of a life overshadowed by depression." The T4YP ensemble present Crave from 5-8 Aug 2010 in Kuala Lumpur. The director is Christopher Ling and movement is by Nicole-Ann Thomas. RADA students perform Cleansed as part of a double bill with Marivaux's La Dispute. The director is Seb Harcombe, designer Sarah Jane Prentice, Lighting designer Amy Schofield, Sound designer Chris Mock, Fight director Bret Yount, Voice coach Ellen Newman, Dialect coach Sally Hague and Dramaturgy Assistant Rachel Malone. The actors are Tom Kay (Carl), Karen Cogan (Robyn), Izabella Urbanowicz (Grace), Rory Fleck-Byrne (Graham), Iain Batchelor (Tinker), Rebecca Blackstone (woman) and Nick Hendrix (Rod). Iain Batchelor is a magnificent Tinker, and Izabella Urbanowicz is a convincing Grace. Note that Robin (male) has become Robyn (female). It is on from 7- 12 Jun 2010. More details are here. Highly recommended. a bit on the side productions present Crave directed by Felicity Nicol, It is on at the PACT Youth Theatre, Erskinevile, Sydney, Australia from 29 Apr- 8 May. Click on the link for more details. A cast of 5 will be performing 4.48 Psychosis at Magdalen College School (Cowley Place, just off The Plane roundabout) on 31 Mar and 1 Apr 2010. Each show will be followed by a half hour discussion. Tickets are £5 adult, £3 concession!! Thanks to Simon for the information. 4:48 Psychosis is performed at Yale Cabaret in New Haven, CT between 1-3 Apr 2010. It is directed by Rachel Spencer. On 1 Apr 2010 there is a discussion following the performance. More details when available. 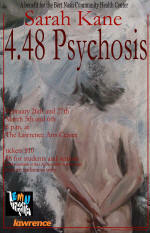 SUNY Fredonia Department of Theatre and Dance present a student production of 4:48 Psychosis. Few details yet, but it is in March or April 2010. More details when available. 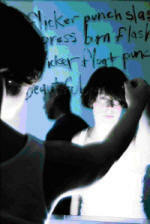 4:48 Psychosis is performed as part of Undergraduate Student Projects in the KU University Theatre (Kansas University). It is directed by Amy Virginia Buchanan. There are a number of student projects, so it is not yet clear on which days 4.48 Psychosis will be performed, but it will be between 25 Mar and 2 Apr 2010. 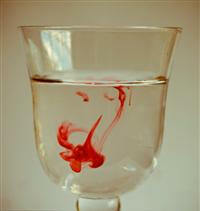 The Barbican Theatre in London presents 4.48 Psychosis performed by the Polish group TR Warszawa. The director is Grzegorz Jarzyna. It is on from 23- 27 Mar 2010. Click on the image for details. 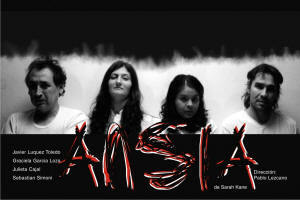 Raw Theater Group present a Joseph Cecela Production of 4.48 Psychosis from 2- 28 Mar 2010. It is at the Access Theater- the gallery. The production is collaboratively directed by the actors Rachel Wood, Julian Sapala, Michael Jefferson and Emily Ciotti. Paula Sapala is co-producer. Click on the image for more details. Thanks to Julian for the information. 4.48 Psychosis will take place in Lawrence, Kansas on 26-27 Feb and 5-6 March 2010 at the Lawrence Arts Center. The producing theatre is EMU Theatre, and the show will be a benefit for the Bert Nash Community Mental Health Center. The director is Dan Born. "4.48 Psychosis is a black snowflake that cannot melt. The poetic and searing story of a young woman's journey to suicide, the script has no stage directions, no set description, not even a cast list or assigned roles. Each production is compelled into uniqueness; the challenge is to make that uniqueness seem inevitable. A director's first duty in this situation is to become an investigator, a beach-comber searching for treasure with only the script for a map. The second duty is to persuade the audience that these encrusted nuggets dug from the sand are in fact treasures. I've had the help, the remarkable help, of a cast and crew who have responded to this tragic work much as I have, with excitement and sadness. I think together we've achieved a vision of this work that is both surprising and compelling. 4.48 Psychosis is one of the truly cathartic plays of modern times. Working out its puzzles, its shifts in tone and style, its heartfelt pleadings and cynical humor, has deepened my appreciation of the life, and uniqueness, in each of us. It's my hope that this production will affect its audience in the same way." A month later there is a separate student production of 4.48 Psychosis in Kansas- lucky Kansas people. Click on the image for more details. Thanks to Dan for the information. Gable Stage at the Biltmore in Florida perform Blasted from 27 Feb- 28 Mar 2010. The director is Joseph Adler and the actors are Betsy Graver, Todd Allen Durkin, and Erik Fabregat. Click on the image for more information. 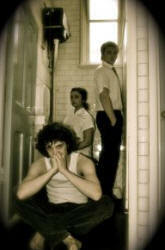 The University of Leeds present Ravenrock Theatre Co performing Phaedra's Love from 25- 27 Feb 2010. "Featuring a live band and their trademark 'impressive physicality performed with discipline and bravery'... A truthful and imaginative piece of theatre inspired not only by kane's text but the camus absurdism that influence. Thanks to Martin for the information. Click on the image for more details. Crave is on in Oxford, UK from 17- 19 Feb 2010. It is at St Hugh's College Bar. The actors are David Griffiths (A), Chris Edson (B), Rosie Wells (C) and Olivia Madin (M) and the director is Chris Jones. Click on the image for more details. There is sometimes an unfortunate lack of tightness in the script… Such aspects of the play that require strong, well-rehearsed conviction, such as the compelling refrain, "Why? ", "What? ", "Why What? ", "What? ", sometimes lack potency. M's (Olivia Madin) indignant character is well portrayed, however, throwing sardonic glances which belie her situation, exploding in the occasional fit of indignant rage; a welcome contrast to C's (Rosie Wells) hand-wringing desolation." The review is from Cherwell. 4:48 Psychosis directed by Tony Estrella is on at The Sandra Feinstein-Gamm Theatre (The Gamm) in Pawtucket, Rhode Island from 14 Jan- 7 Feb 2010. This is a two person 4.48 with Casey Seymour Kim as the woman and Tom Gleadow as the doctor. Lighting Design by Matthew Terry, Sound Design by Charles Cofone, Technical Direction by Dade Veron, Stage Management by Stef Work and Videography by Mike Jones. Little Green Pig Theatrical Concern presents 4.48 Psychosis in ,Durham, North Carolina, USA from 4- 13 Feb 2010. The director is Tom O'Connor with Chris Burner and Dana Marks. Stage Managed by Laine Staton. Click on the image for more details.